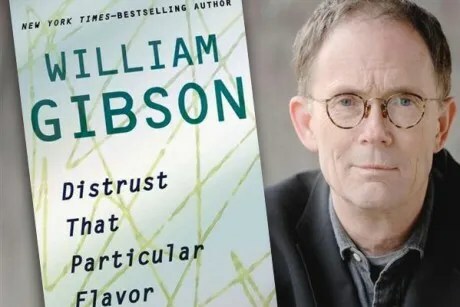 On the Toronto stop of his book tour this month, William Gibson was asked by an earnest 20-something reader for advice: “Give my generation whatever you think is helpful for it to survive.” Where an author with an inflated sense of self-worth might have dispensed a few pearls of wisdom, Gibson replied that one should distrust people on stages offering programs for how to build the future. As much as people look to Gibson as a prophet, the science-fiction writer who invented the term “cyberspace” (in the 1982 short story “Burning Chrome”) helped conceptualize the ways we interact with the Web (in 1984’s “Neuromancer” and later works) and foretold the explosion of reality TV (in 1993’s “Virtual Light”) is notoriously reluctant to predict the future. The title of his new collection of journalism and essays, “Distrust That Particular Flavor,” is taken from a piece on H.G. Wells where Gibson explains his suspicion of “the perpetually impatient and somehow perpetually unworldly futurist, seeing his model going terminally wrong in the hands of the less clever.” Though he’s often able to extrapolate from the present with great prescience, Gibson prefers to probe, not prescribe.